FANUC India offers state-of-the-art CNC Packages with digital servo technology that are highly reliable with user-friendly operator and maintenance interfaces. These features combined with our maintenance programs provide our customers with unparalleled lowest total cost of ownership. We have a wide range of CNC products to cater to diverse industry needs - from the most simple to the highly complex metal cutting as well as motion control applications. FANUC enjoys a leadership position in the Indian machine-tools industry and is ideally poised to meet all your automation needs. We welcome you to explore our engineering innovations in Factory Automation. FANUC is the worlds largest manufacturer of Industrial Robots with over 200,000 installations across the world. In India also FANUC maintains its leadership position with total robot installation in excess of 4700. FANUC Robots are used in a variety of industry applications such as Material Handling, Spot Welding, Arc Welding, Machine Tending, Press Tending, Die Cast Extraction & Spray, Ladling, Sand core handling, Forge Tending, Fettling, Ultrasonic Welding, Plasma Spray, Plasma Cutting, Laser Cutting, Deburring, Sealant Dispensing, Assembly, Painting & Inspection. 1200 Kg. These Robots come with various mounting configurations such as Floor Mount, Ceiling Mount, Rail (Shuttle) Mount and overhead Gantry Mount. FANUC also offers application specific Robots such as Painting Robots, Food Grade type Robots, Wash Down (IP67) type Robots, Arc Welding Robots and Spot Welding Robots. FANUC Robots are known for their very high reliability and performance. FANUC manufactures many components of Robots in-house such as Servo Motor, Servo Amplifier, Mechanical Unit, Robot Controller etc., thereby exercising great control on quality and performance. Intelligent Robot features such as Integrated 2D & 3D Vision, Force Sensor, High Speed Collision Detection, Soft Float function, Vibration Suppression, Vision Shift, Vision Tracking, Constant Path add great performance benefits. FANUC Robot uses the advanced Robot Controller 30iA with PMC (Programmable Machine Controller) for Robot Motion Control along with I/O control with very fast update time. Additional Digital I/O to control external devices either through On board or Remote type is possible. This eliminates the requirement of Interface Panel in many cases as controller plus PMC facility can handle many functions. Robot Controller 30iA enable easy addition of auxiliary axis for Tool or Positioner. Some of commonly used auxiliary axis are for 1-Axis Positioner, 2-Axis Positioner, Servo Gun (Spot Welding), Servo Pump (Sealant Application) & Ladling Tool (Ladling Application). FANUC believes in providing Robot System Solution to customers. FANUC India has State of the Art System Engineering facilities to provide variety of System Solution on Turnkey Basis. A well trained and experienced team of Engineers involved in Design, Engineering, Manufacturing and Commissioning of Robot Systems. Finite Elements Analysis ensures rigid cast iron base & other elements. This results in good damping effect & reduced vibration in the machine leading to better tool life (CG is well balanced throughout machining area). The Robodrill is aptly named `Small Vertical Machining Centre’. The BBT-30 spindle with High Torque (Upto 100 Nm for 1min) is most efficient and reliable for Cast Iron and stainless steel components machining. As of today, we have more than 4000 successful installations in 2W & 4W segment with 0.01 MTBF (1 failure in 100 months). Service backup: We have 100 service engineers across India, all trained on multiple FANUC products at Japan. We have inventory of Rs. 1 billion worth of spare parts. The Robodrill is best suited for high production, high precision components for machining on SS, CI, Aluminum, graphite, Die Mold etc. We have proven performance in machining of engine components, valve body, Cylinder block, Cylinder head, crank case, crank shaft, cam shaft, housing, end cover, connecting rod, gear shifters, heat exchanger components, Die Mold etc. The productivity is comparatively 20% better than any other VMC available in the market. Machine Delivery: Robodrill machines are the fastest moving VMC’s in the world. We have the facility to produce 5000 machines per month and we can provide best possible delivery. FANUC Corporation Japan is a pioneer in the development of All Electric Injection moulding machine. Celebrating 31st Anniversary in Year 2015, FANUC holds a leadership position, with a worldwide installation base of more than 45,000 Units. Faster Cycle times: Increased Productivity to the tune of 30% thru independent motor control & Parallel operations. Excellent Accuracy, repeatability and consistency leads to raw material savings. Roboshot’s unique Power Source Regeneration function realizes power savings ranging to 20% w.r.t other Electric machines. Consumes much less power ranging 1/3rd than their Hydraulic counterparts. Reliability: Our MTBF (Installed base in India for > 500 Units) is 0.021 units per month which translates to one failure once every 48 months. High Reliability supported by High rigidity Mechanism. Predictive Maintenance function thru Backflow monitor analysis. 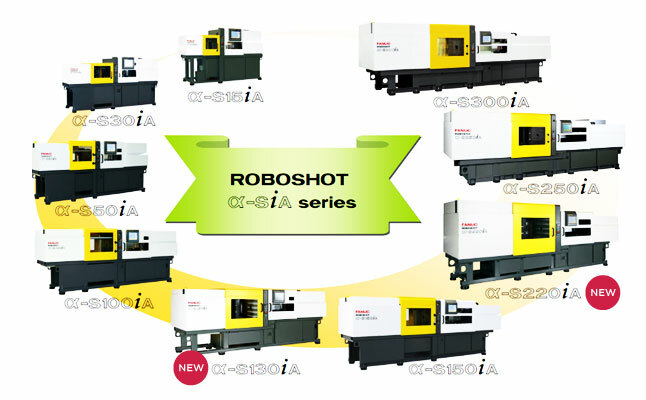 Ease of Operation: Makes Roboshot the preferred choice of Injection moulders worldwide. The machine literally talks to you in the form of intelligent display trend of key parameters, enabling you to take an informed decision, instantly. Lowest Total cost of ownership: “The issue is total operating cost” & Roboshot is very cost effective across all Application segments ranging from Automotive, Precision Connectors, Medical, Thin Wall Packaging, Caps & Closures, Industrial, Electrical & Electronics; Irrigation & so on. The FANUC ROBOCUT, is a high reliability, high performance wire cut electric discharge machine with FANUC standard CNC FS 31i-WB. Thus, this compact size machine can not only do cutting with almost twice the cutting speed as compared to other machines but is also highly accurate and economical. This machine is best suitable for all kinds of high accuracy jobs with 0.1 Ra , larger taper cutting applications, PCD cutting , medical parts, Die parts etc. This feature preci This feature preci This feature precisely counts the effective discharge pulses per unit time. The intelligence of the machine counts the pulses, which are actually contributing in the cutting, and the pulses, which are not contributing in the cutting. Accordingly to maximize the efficiency, the feed is controlled in Nanometer. Machine Base Structure: The mechanical part is independent of the electric part and the water tank. The machine is not affected by the heat of the electrical components and the temperature changes in the water tank. There are no mechanical stresses from the electrical part or water tank. Nano Interpolation: Nano interpolation enables the CNC to distribute positioning commands more accurately with a pitch of 0.001μm (1 Nanometer, 1000th part of 1 micron). In accordance with these commands, the servo motor equipped with the ultra-high resolution of 16 million pulse coder feeds all machine axes accurately for positioning. This excellent FANUC CNC and servo system achieves very high precision cutting. Core Joint Function: Newly introduced Core joint function to avoid core (slug) falling down and damaging the lower nozzle. Single Source Supply: The Hardware such as CNC Control System, Servo Motors and other electrical parts are from single source i.e. FANUC Ltd., Japan. The Software with innovative, powerful and advance features is also from FANUC Ltd. The machine is also from FANUC Ltd.
FANUC Series 31i-B CNC control with a 15" large LCD touch screen, USB device as standard, twin servo wire tension control (reduces tension variation to 1/4th of conventional machining), Inverter controlled water temperature management, Servo water level control, Thermal insulation structure, AI Corner Control where wire slack is immediately removed before a corner to deliver precise corners without changing cutting path. U-V axis with a stroke of +/- 60 mm helps to generate large tapers on a thick workpiece. Use of symmetrical casting structure, Pre-Sealing mechanism and Use of Die Guide etc. had contributed to machine performance. This Submerged, compact size, Electrolysis AC cutting machine has excellent rust and corrosion protection effects, greatly reducing damaged layers in comparison with DC cutting. This prevents decrease in hardness of the discharge-cut surface and greatly improves the life of the Die. Machine Delivery: With a factory capacity of 5,000 machines per month we can provide best possible delivery. FANUC has been in the forefront of technological innovations by introducing new intelligent features useful in performing many complicated applications in industry. FANUC ROBODRILL is suitable for Versatile Applications to Meet Wide-variety of Machining Needs.